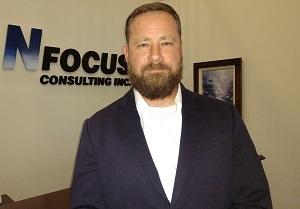 NFocus is excited to announce the appointment of Cliff Reynolds to the role of Director of Information Technology. Cliff brings a wealth of experience to the NFocus team including IT infrastructure, global manufacturing, system operations, and network management. Cliff’s background includes working as an IT Project Manager and Senior Program Director for Fortune 500 companies in the Midwest. Cliff also spent 15 years in IT Infrastructure and Operations for the United States Marine Corps. Cliff lives in Lancaster with his wife and four kids. Cliff volunteers with veterans helping them transition into jobs after their service ends by assisting them with job placement services and is the President for the Lancaster Gales Youth Football Association. About NFocus: NFocus is a company rooted in strong data, supported by knowledgeable people, and strengthened by innovative solutions to accelerate growth. Founded in 1989, NFocus helps marketers succeed through our proprietary marketing technology, robust data portfolio, and extensive industry experience. Processing billions of data records annually, NFocus is a proven marketing partner for a variety of clients across the United States.